Reel in a marked or tagged fish? Let us know! See other news releases, Showcasing the DNR stories and photos and other resources at michigan.gov/dnrpressroom. If you fish the Great Lakes and catch a marked and tagged fish, please report it. You’re helping the DNR collect critical information about the state’s fish populations and trends. The department has used a coded-wire tag program to “mass mark” various fish species in Michigan since the 1980s. Mass marking provides data that helps fisheries biologists determine the value of naturally reproduced fish versus stocked fish, as well as the lakewide movement of fish. The program involves implanting a small, coded-wire tag, invisible to the naked eye, into the snout of a fish. A fish containing a coded-wire tag can be identified because its adipose fin (the small, fleshy fin between the dorsal and tail fins) has been removed. Anglers who catch these tagged fish can help by recording needed information about the fish, removing and freezing the fish’s snout, and taking it to one of the designated drop-off locations around the state. The DNR, in conjunction with the U.S. 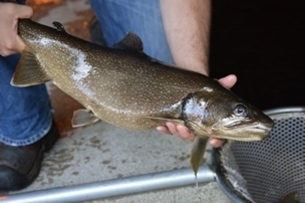 Fish and Wildlife Service and other state agencies, places coded-wire tags in the snout and removes the adipose fin from lake trout, rainbow trout (steelhead), and chinook and Atlantic salmon stocked into lakes Huron and Michigan. Beginning in 2018, all rainbow trout stocked in Lake Huron and Lake Michigan (including tributaries) will contain a coded-wire tag. All chinook salmon stocked in Lake Huron will contain a coded-wire tag, while only a portion of those stocked in Lake Michigan will contain the tag. Get more details about the DNR’s mass marking efforts at michigan.gov/taggedfish or by contacting John Clevenger, 231-547-2914 or Elyse Walter, 517-284-5839. Home to an expansive 12,500-mile network of trails just waiting to be explored, Michigan is cementing its reputation as the nation’s Trails State. It’s also the perfect place to take part in National Trails Day Saturday, June 2. The American Hiking Society’s National Trails Day is traditionally the first Saturday in June. It offers opportunities to join local hiking, horseback riding, paddling and other trail events, to host an event, or to help clean up and beautify areas along trails. The annual recognition day also is a great time to showcase the valuable work volunteers do all year long to take care of America’s trails. In support of this trails promotion effort, a Michigan House resolution also is in the works to recognize June 2 as National Trails Day in Michigan. 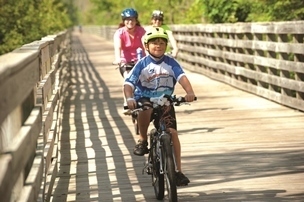 One of Michigan’s largest organized activities that day involves groups of Boy and Girl Scouts spending time on hiking and biking trails, including Michigan’s Iron Belle Trail – the longest designated state trail in the nation. Scouts all over the state will hit the trail for the Iron Belle Challenge, to see how many miles they can collectively walk, ride or paddle. Participating Scouts will get a special patch from the DNR. The opening of a new trailhead on the Clinton River Trail in Oakland County. Ribbon-cuttings on the Paint Creek Trail in Lake Orion and the new Polly Ann Trail/Larry Obrecht Bridge in Oxford. Find the trail adventure that’s right for you at michigan.gov/dnrtrails, or call Doug Donnelly, 517-284-6109. For more than a century, fish have been reared at Michigan’s state fish hatcheries. If you’ve ever been curious about what happens at these unique facilities, the DNR encourages you to plan a visit with family or friends this summer and see this very cool work as it happens. Reintroduce species that have disappeared from Michigan waters. Michigan’s six state fish hatcheries are Harrietta State Fish Hatchery (Wexford County), Marquette State Fish Hatchery (Marquette County), Oden State Fish Hatchery (Emmet County), Platte River State Fish Hatchery (Benzie County), Thompson State Fish Hatchery (Schoolcraft County) and Wolf Lake State Fish Hatchery (Van Buren County). All are open to the public. Want to learn more? Visit michigan.gov/hatcheries or contact Elyse Walter, 517-284-5839 or Ed Eisch, 231-922-6055. Wildlife professionals from more than a dozen states and Canadian provinces recently in Michigan for the DNR-hosted Eastern Elk Management Workshop got a treat. 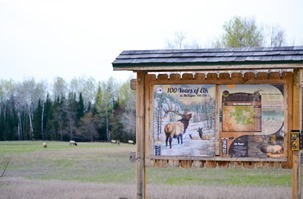 While on a planned viewing tour along the eastern edge of Michigan’s core elk range, the group came upon several elk in the fields just beyond one of the department’s elk information kiosks. The three kiosk/viewing locations – the other two are within the Pigeon River Country State Forest – were chosen for their high likelihood of spotting elk active in these areas. However, there are many more locations highlighted on the online elk viewing map where such sightings are possible. For those hoping to join in any of the coming season’s elk hunting periods, be sure to apply before June 1. Drawing results will be posted online June 25. This year, the DNR celebrates the 100th anniversary of elk being re-established here. In 1918, seven elk were brought from the western United States and released near Wolverine, Michigan – a milestone that set the stage for the species’ population growth. A special “elk edition” of the DNR’s habitat license plate – which generates revenue for the nongame fish and wildlife fund – is available through Secretary of State. It’s an easy, benefical way to show your elk pride. Learn more about elk viewing and hunting opportunities and the elk license plate at michigan.gov/elk or by calling Katie Keen, 989-385-0336. Firewood producers who want to improve their businesses’ profitability and learn the latest management and production practices are invited to attend the National Firewood Workshop June 20 and 21 near Frankenmuth. 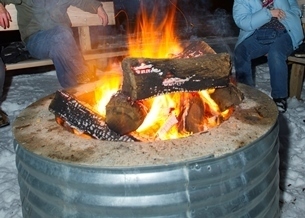 Topics to be covered at the two-day educational and networking event include the basics of firewood heat treatment – an important step in removing invasive pests from firewood – as well as good business strategy and management practices, updates on the changing nature of the firewood industry, and tips on marketing firewood in urban and rural settings. Wood quarantine and regulations to help prevent the spread of pests and disease also will be discussed. The event takes place at Michigan State University’s Saginaw Valley Research and Extension Center, 3775 S. Reese Road, Frankenmuth. The conference opens at 8:30 a.m. on June 20 and closes at noon on June 21. Register online with MSU or check out a workshop agenda. The workshop cost is $35 per person. Besides the DNR, sponsors include Michigan State University, North Carolina State University, the Michigan Department of Agriculture and Rural Development, the Michigan Invasive Species Grant Program, the U.S. Forest Service Wood Education and Resource Center, the Forest Products Society and Sawmill & Woodlot Management magazine. PHOTOS AVAILABLE: High-resolution versions of the images in the stories above are available in this photo folder. Always wanted to try your hand with a bow and arrow? Learn the basics of shooting at the May 27 "Archery - Try It" class at the Outdoor Adventure Center in Detroit. This class is included with the price of admission to the center. Hoping to squeeze in a little Memorial Day weekend camping? Several parks still have openings! See what's available by picking a reservation type, leaving "Michigan State Parks" in the "park" field and completing the search. People who hunt, fish or trap outside Michigan's set seasons pose a serious threat to the state's fish and wildlife. If you witness a natural resources violation, please report it by calling or texting or completing an online form.